Emanuel Franciszek (Manny) Andruszewski, was born 4th October, 1955 in Eastleigh, Hampshire of Polish parents. He joined Southampton as an associate schoolboy in November 1970, having played for St. Georges School and represented Southampton & Hampshire Schools. Ted Bates and Lawrie McMenemy signed him firstly as an amateur and then, in October 1973, as a professional. He graduated through the reserves, playing alongside players such as Nick Holmes, David Walker and Malcolm Waldron, making his first team debut on 1st February, 1975 in a 3-0 victory away to West Bromwich Albion in League Division 2. He had replaced Steve Mills, who had been seriously injured in a road crash. He retained his place for the rest of the 1974-75 season, in which he made 16 appearances. He was an uncompromising tackler and was at his best when given a particular opponent to shadow and was often brought in to the side to perform a specific man-marking task. He rarely got forward into attack, but the few goals that he did score were usually fairly special. On 5th March, 1977, he scored the winner against Charlton Athletic, when he crashed a shot past the keeper after running on to a return pass from Mick Channon. In the 1977-78 season, he was selected fairly regularly including appearing in the final 13 games as Saints finished as runners-up (to Bolton Wanderers) to gain promotion back to Division 1. His finest game for the Saints was against Birmingham City in the Football League Cup on 29th August, 1978, when he shackled Trevor Francis so well that Saints were able to notch up a 5-2 victory, which set them on the way to the League Cup final at Wembley against Nottingham Forest on 17th March, 1979. Unfortunately, although Manny had featured in several of the earlier games, he didn’t even make the bench for the final. He continued to make occasional appearances over the next season, before being transferred for £150,000 to the Rowdies in May 1980. His period in the USA was not a great success and was cut short by illness. He briefly returned to The Dell in 1982, although he made no further first-team appearances. In all he made exactly 100 appearances for Southampton’s first team, scoring 3 goals. 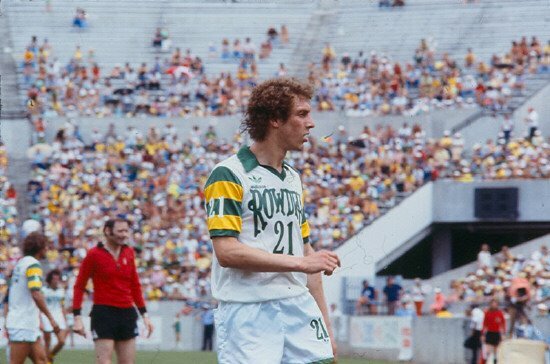 In the season 1982-83, he signed for Aldershot, and then returned to the USA to play indoor soccer with Houston Dynamos for the summer of 1984, and the for Dallas Sidekicks from November 1984 to May 1985. Could play as a full back, central defender or even in midfield, but wherever he was asked to play, he always gave 100%. After retiring from football, he worked for Peter Green furniture stores and in 2005 he set up his own gardening business in Eastleigh. Thanks to Mike Connell for the photo.